Our research is committed to scientific standards and objective knowledge. Through focused measures, we ensure the quality of our work across projects. We are certified according to ISO standard 20252 2012-06 and have been awarded several times for the quality of our work in the image study by marktforschung.de. Transparent customer communication, further training of our employees and project management from a single source are important components of GIM Quality Management. For us, data quality means survey quality in the first step. That is why our recruitment of study participants is based on a professional and comprehensive briefing. All GIM service providers are committed to complying with our quality standards. Through continuous supervision, we guarantee data protection according to GDPR as well as a comprehensive and modern IT infrastructure and IT security. With the TISAX certification, GIM follows the common standard for information security in the automotive industry. Through our memberships we commit ourselves to adhere to the quality standards of ESOMAR, ADM, BVM, DGOF and EphMRA. In addition, we work according to industry-specific guidelines (e.g. for the pharmaceutical industry). We have a modern IT infrastructure as well as a GDPR compliant data protection concept, which not only takes into account all relevant data protection laws but also the strict guidelines of our professional associations. The security of our systems and processes is regularly checked and certified by independent auditors. Further information on data protection can be found here. 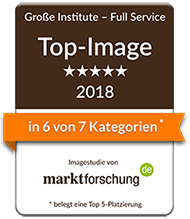 In the current image study by marktforschung.de, GIM achieved one of the top placings and ranked third in the overall evaluation. In terms of quality ("Which institute has the highest standard? "), we ranked second. In 2015, GIM was among the top institutes in the image study as well. GIM (Heidelberg) has been TISAX certified since 2018. TISAX (Trusted Information Security Assessment Exchange) is a common standard for information security in the automotive industry. The operator of the testing and exchange mechanism is the ENX Association. Since April 2018, GIM carries the ISO quality label for the market research industry. ISO 20252: 2012-06 is the most comprehensive and important international standard for market research. It makes it possible to define research processes and applied methods according to a uniform quality standard and to review their implementation later. With the official certification according to ISO 20252: 2012-06, we provide further central proof of the high quality standards of our work. Global Customized Partnerships: Learn more about our cooperation with international institutes. International GIM Quality Standards: Gain insight into measures we have developed to ensure the quality of our international research.